We had a lot of rain and overcast last week, keeping me indoors in the afternoons. Afternoon-time is when I usually tackle an extra project for the day. If I can, I get outside and do some gardening. Last week, I didn't have as many opportunities for gardening, so on 3 different days, I decided to make 3 different jams. In our house, with what we get in abundance, we have our "ordinary" jams, most notably, the wild blackberry jam and the plum jam. I also make jelly every other summer with either red currants or crab apples. Those are ordinary jam/jelly flavors for us. Perhaps because of the abundance of their availability, those flavors hold no special appeal to me, and I just don't eat them. But I do have a couple of jam flavors that I find truly divine. I love the flavor of homemade strawberry jam, really delicious stuff. And my all-time favorite jam, from my childhood, is raspberry. And now, I have a new extra-favorite flavor, Vanilla-Rhubarb Butter. My husband has been picking the wild strawberries that grow on our property, and leaving them in the fridge for me to use. Early in the week, I had about a quart of these strawberries to use up, so I made a batch of wild strawberry jam. Wild strawberries have more of the strawberry flavor than cultivated strawberries (especially more than the ones grown for shipping out of state). So these made great jam. I'm not fond of the whole-strawberry-in-my-jam thing, so I rough-chopped them with my immersion blender before cooking (hence the appearance difference from traditional strawberry jam). We do grow raspberries in our garden. And almost every year, I put off making the jam until too late, and we've eaten almost all of the raspberries, fresh. This year, I just said to myself, "why wait to make the jam?" So rather than having lots of fresh raspberries a couple of nights in a row, I made a batch of jam with almost a quart of the fresh raspberries. I know we'll get out fill of fresh ones, but now I'm certain of some jam for later in the year. And then on Wednesday, I was working n the garden for part of the afternoon, out weeding by the rhubarb. You know how it is when you're pulling weeds, you have lots of time to think and plan. And that's when I thought to make some Vanilla-Rhubarb Butter. I've seen lots of recipes online for variations of vanilla-rhubarb jam, but I wanted something smoother in texture. 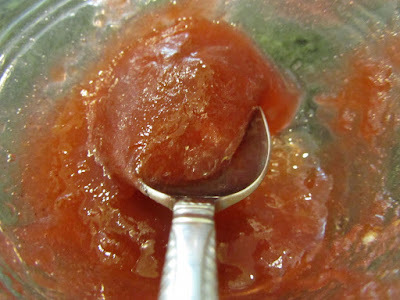 As I was thinking there in the garden, I decided I would puree my cooked rhubarb/sugar, and make it into a butter. Anyways, I made the butter by tossing chopped rhubarb and sugar together in a stainless saucepan, and leaving to sit for a couple of hours. Sugar is a natural humectant, so it draws the water out of fruit. The end result is not needing to add any water or other cooking liquid to the jam. Some recipes will say to allow the fruit and sugar to sit, macerating, overnight. I've found just a couple of hours does the trick. Maybe it's better to allow it to sit overnight? It works for me, this way, so why fix it?! Okay, back to making Vanilla-Rhubarb Butter. I had a couple of vanilla beans as well as extract on hand. My initial thought was to use the extract. My second thought was to save the extract, as vodka is so expensive in our state, my extract is costly to make. So I bypassed the extract, and just used half of a small-ish vanilla bean. 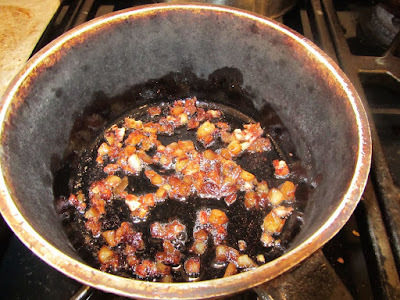 So, when my rhubarb was ready to cook, I took half of a vanilla bean and pulled it apart, lengthwise, to expose the interior of the bean and infuse more flavor. I stirred the mixture while it cooked. When all was cooked, and the sugar was syrupy and thick, I pulled out the vanilla bean pieces and pureed the whole batch with an immersion blender. I found with the vanilla flavor, that not as much sugar was needed, as a recipe for plain rhubarb jam called for. My initial recipe called for equal parts of sugar and rhubarb. As butter, it was too sweet. So I cooked up some thin-sliced rhubarb stalks until I had a ratio of 3 parts rhubarb to 2 parts sugar. When all of that was done cooking, I pureed once more, until I had just the right flavor. 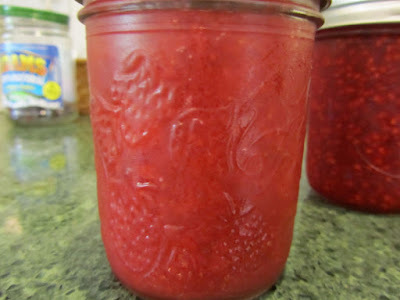 If you do make a vanilla-fruit jam or butter, while the vanilla bean would look pretty inside the jar, you can also rescue that bean to reuse in subsequent batches throughout summer. I pulled my bean pieces out, rinsed with a bit of water, then bagged up for the freezer. I'll be able to use this same beans a few times this summer. It's flavor may weaken a bit with use, but towards then end, I can always add a bit of extract to subsidize the flavor from the bean, at that time. I kind of think I'll be able to get a lot of flavor from that one bean, though. considering how much flavor you can get from a couple of vanilla beans, when making your own extract. As for the flavor of this butter, one of my daughters said it tastes like pie filling. It's flavor is divine. Rhubarb is one of those plentiful garden items, with only a handful of uses in the kitchen. So, this recipe is definitely a keeper for us. I have more than enough rhubarb to make several jars of this butter, give some away, and then have more left for us to use. I have never let my butter fruit sit in sugar for a while before cooking. I'm gonna have to remember that trick. Do you ever make freezer jams? The fruits always taste so fresh that way, but it's harder to store. I made freezer strawberry jam, many years ago. It was delicious and fresh-tasting. 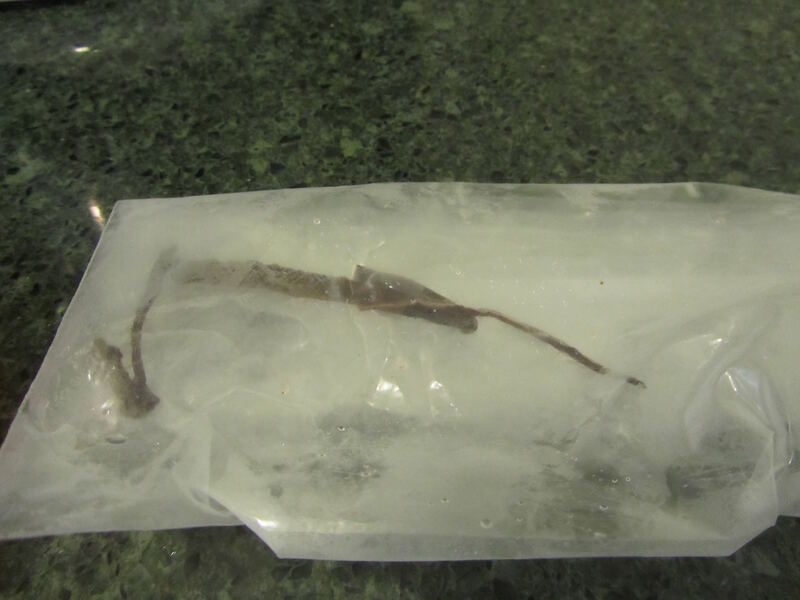 Like you said, the difficulty is in storing it, when freezer space at a premium. The other thing I recall is the freezer recipe I used, required pectin. I never tried it without the pectin, so I don't know how it would work without it, but when I make canned jam, I don't add pectin. I follow older recipes which call for cooking the fruit until it's thick. And we're okay with jam being a bit thinner than commercial. I tend to reserve the pectin for jelly. 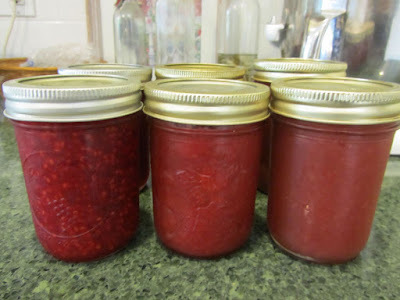 Do you get enough strawberries from Uncle Billy's garden for making jam? I often have this feeling with garden strawberries, that I shouldn't be wasting them on jam, but enjoying them fresh. So the years that we actually have strawberry jam are few. Oh, I'm so envious! Peaches don't grow well in my area, so they are a treat! Your peach jam sounds delicious! Good trick with the sugar. We do that with cranberries for some recipes, too. I do freeze fruit sauces, like applesauce and rhubarb sauce, instead of canning. Maybe just habit or what I'm accustomed to. Or maybe, with fruit sauce having less sugar than jam, I feel it could spoil more easily, so better to freeze it. For me, it's not much extra work to get out my large pot and other equipment for sterilizing, and water-bath for jams and jellies. I sterilize jars for a couple of other tasks in the kitchen on a weekly basis, so I keep all of that stuff very handy in the pantry. I remember when my mom would make jam, she used wax to seal the top of the jars. Now that sounds like extra work to me, as she had to have an extra pot for melting the wax, and then would have to clean out that pot afterward. I don't think she had a dedicated pot for the wax. Hmmm. My canning stuff is pretty handy, too; and I've definitely "canned on the fly" lots of times. My non-canning friends have commented with amazement. Besides, if you're not doing a full canner of something, seems likely you won't have so much that you'll be saving it for a year. You're probably just keeping it fresh for a short-term "later" use, don't you think? I guess I just don't think of it as being troublesome. We are at sea level, here, so I guess our water comes to a boil a lot faster. Hmm, I guess we have a different approach to what is something to keep for a long time, vs what will be eaten right away. For most of my jam and pickles, I intend for us to use them in winter and early spring, when we don't have access to the fresh fruit. So I am storing them for a long period of time. And some of them I only make every other year, to use over the course of 2 years. Some of that is "plan" and some of that is just how it works out. ie my family won't think to eat strawberry jam right now, as we have fresh strawberries in the garden. But in winter, when fresh strawberries are a distant memory, the jam is cherished. So this is what works for us. It just occurred to me... I ALWAYS can for our orchard harvest (and when I get citrus from friends/family in warmer areas), because I AM planning that to have to last all year/mostly use later because we have enough for right then, too. Since we don't have a garden now, when we get medium-sized amount of soft fruits, for example, it's a "windfall", not a harvest. Since we don't have the constant garden resources coming in at the same time (so no "access to fresh fruit" though it's fruit season, if you will), we try to spread out our use/enjoyment of those fruits. But it's part of our "current" resources, not absolutely "surplus" to save for a leaner time/winter. I think that's the difference -- one more of resources than intention, if you will. Hopefully soon we'll have a garden, too! Yummy to the jam! We do love our homemade jam at our house. 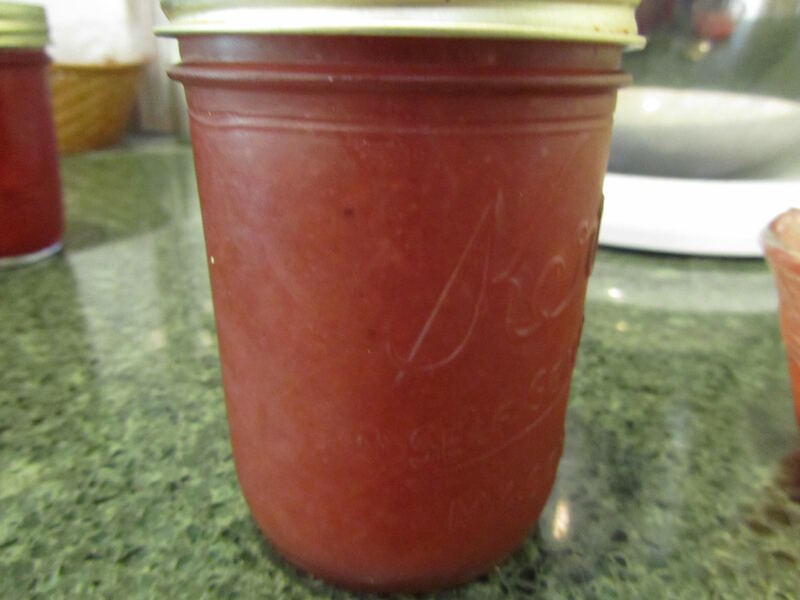 I freeze plenty of rhubarb and strawberries from Dad's garden to make jam in the winter. That way I get fresh jam all year round. Dad and Mom have this rule that the first strawberries are the best for fresh eating but as the season winds down the strawberries are of lesser size and even uglier than the first ones. Those are the only ones that should be used for jam (in their opinion). I use that rule also. Those get frozen from jams later. We buy peaches when they go on sale and I freeze those also for peach jam in the winter. I do those very quickly since they tend to turn brown when I thaw them. 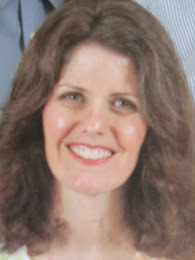 I always use lower sugar sure gel pectin since that is what mom used. I use the "cooked jam" recipe and instead of canning the jam, I freeze it. It comes out beautifully and never becomes runny when it's thawed. I love a few raspberries but I don't like all the seeds in my jam so sadly I buy seedless raspberry jam. I tried it once to remove the seeds and it is som much work that I don't bother with that anymore. That is really the only jams we eat at home. I'm now waiting for the sure gel to go on the end-of-season sale and then I'll stock up on a few boxes. that does sound like you would have fresher jam, year round. I've done that with surplus frozen blackberries, before. If we get towards the end of the year, and still have lots of blackberries just weeks from the beginning of the new harvest, then I make extra jam. I don't mind the seeds in jam, but I understand how that must be for you. Making seedless raspberry jam does sound like a lot of extra work, putting all of the cooked fruit through a sieve. Definitely, those first strawberries are the largest and prettiest, best for fresh-eating. My sister in law makes blueberry rhubarb jam. Yummy and all the grandkids mine included love it. She gave me two jars to take to my 80 year old father. He was tickled . I could make the same recipe but would not taste like hers on the other hand she loves my apple jelly with a cinnamon stick in it . Adding vanilla sounds really good will have to give it a try. I wish we had enough berries to make jam. :) They get gobbled up. I have a thingy for removing seeds from berries. Not sure what to call it. It has lots of small holes.It has a basket about a cup and you put in berries and swish(after fruit is cooked) down with the top. Belonged to my Mom. like the seeds in the berry jam. You have been busy. I laughed when I read about you having enough wild strawberries to make jam with. The kids picked some at mom's yesterday and today, but they are miniscule and only enough for a handful of eating! I suspect there are more out there, but they are covered in poison ivy plants, so we will forego that experience. I have never heard of blueberry rhubarb jam and I might want to try it. How much of each fruit? Is there a recipe somewhere (like on the pectin box)? It doesn't sound like the two fruits would go together but apparently they do! 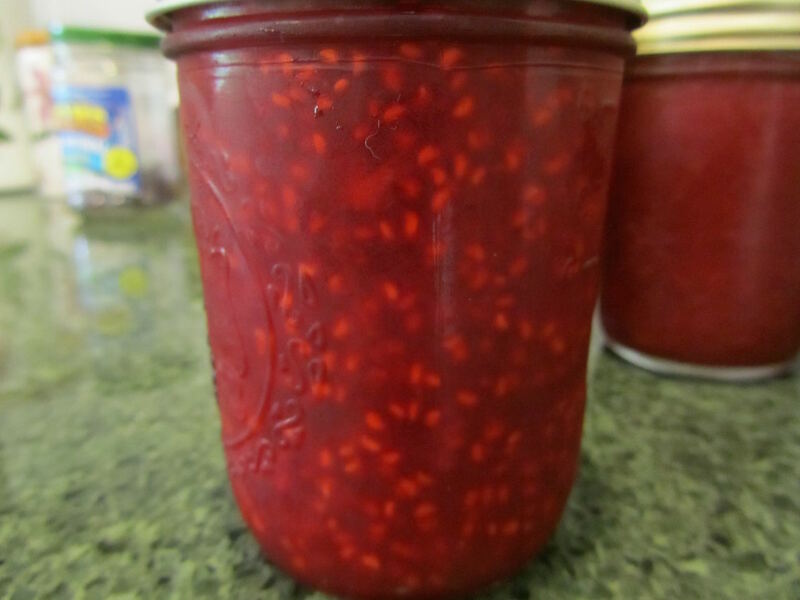 We are in the midst of moving my mom right now, and she's the one who makes the jam--I'll try to remember to ask her in a couple of weeks when things settle down. Alice if the recipe calls for 4 cups of fruit you would use 2 of blueberries and two of rhubarb.